” There were breweries operating under the Schultheiss and Kindl names in both East and West Berlin, though, of course, those in the East were state-owned. The old Kindl Brewery, located in East Berlin, was about the only thing that worked well in the former DDR. It was not subjected to the growing homogenization of lager beers that evolved into what is known as Eurolagers. Kindl beers kept much of their old world charm. But the march of history left those beer styles behind. About 1000 years ago villages like Wharram Percy were quite common across all of Great Britain. Wharram Percy, located along the Yorkshire Wolds, was once populated by English peasantry. At its height, no more than a 50 families lived here. They farmed cereal crops for their local lord. In those days farmers grew barley and wheat as their main staple crops. As anthropologist Brain Fagan noted, most of the families in Wharram Percy lived simple lives. Their homes were made of stone and thatch, and they housed both the peasants and their livestock. Even during the Medieval Warm Period (circa AD800 to AD1350), when the climate of Europe was optimal for the growing of both cereal crops and wine, the vast peasantry struggled to survive. The average life span of the peasant was at best 30 years, and forensic scientists found that many skeletal remains showed signs of severe arthritis, back deformities, and mal-nutrition. The village itself contained one long street (unpaved, of course) which ran north to south. Two Manor Houses, as well as perhaps 2 dozen peasant cruck houses, gardens, a mill, and perhaps a house for a tradesman or 2 made up Wharram Percy. An ancient Catholic Church, Saint Martin was located at the south edge. From sun-up to sun-down the villages performed the back-breaking work needed to survive from one growing season to the next. Local feast days were the only breaks the peasantry of the Middle Ages enjoyed. Wharram Percy would be no different. Roads were few and far between; canals were unheard of; and brigands and thieves were common. The inhabitants of Wharram Percy practiced subsistence farming. Even one poor harvest would have meant famine. Hunger was a persistent reality – even in good years. As the Medieval Warm Period began to wane in the 14th Century, so did the long, mild growing seasons. From 1315 to 1319 disaster hit Europe. In 1315 alone it rained from Pentecost through the end of September with little break. Cereal crops were washed away or failed to give a decent yield. Farmers in Great Britain had to use their seed crops to survive; famine hit in the Winter of 1316 when temperatures for the first time in centuries fell below 0 degrees Fahrenheit. This pattern persisted for the next 5 years, and nearly half of Europe’s population died from starvation or disease. An invasion by Scots in 1323 only added to the decline. For the next 2 centuries the climate began to persistently cool, and growing season shortened. Villages like Wharram Percy began to die out slowly as local land owners turned to animal husbandry – especially raising sheep for the wool trade. In 1523, the Lord of the Manor evicted the few residents of Wharram Percy that remained and tore down the houses in order to make room for more pasture land. Only Saint Martin remained. Wharram Percy fell off the maps and out of memory. It was only re-discovered in the late 1940s and has remained a place of careful excavation as well as a tourist site. The recent ruling concerning the ACA (Affordable Care Act) penned by Chief Justice Roberts doesn’t change the fact that the ACA is bad law from both Natural Law and Constitutional Law point of view. In the coming months and years Catholics will find just how bad this law is. Not only was Due Process shredded, but the Court Majority willfully re-wrote the ACA in order to save it. Right Reason was dispensed with in order to reach a desired outcome. We will be living with the unintended consequences of this ruling for years to come. 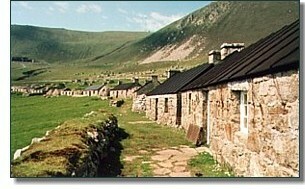 Located just 45 miles off the Western Coast of Scotland is the island of Saint Kilda. For nearly 1300 years this wind-swept, desolate island was inhabited first by Norsemen and later Scots. 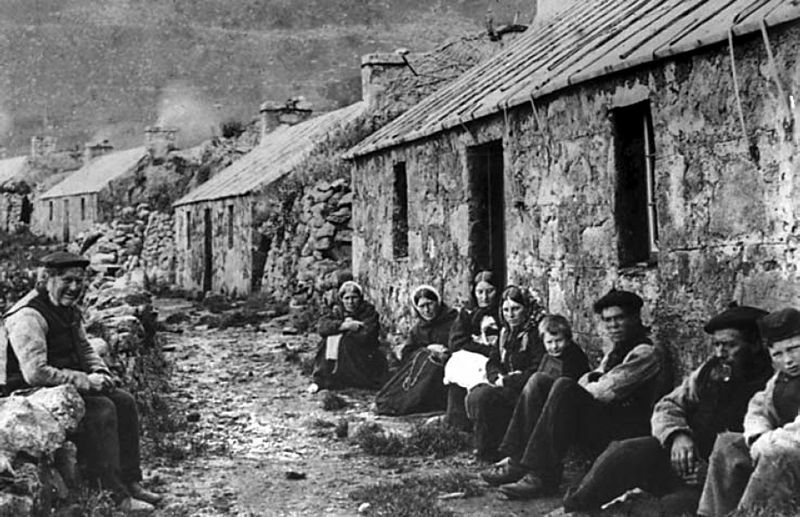 A hundred years ago many inhabitants left the harsh, isolated life on the island for Australia. In 1930 the remainder abandoned Saint Kilda, and the island became a nature preserve. Today, the RAF operates a signals station and its one pub.